Data on vegetable consumption broken down by income level reveal that individuals (children and adults) in households with incomes below 185 percent of the poverty level consumed smaller quantities of potatoes and tomatoes than people in households with incomes above that level. In 2007-08, lower income individuals consumed 49.3 and 28.1 pounds per person per year of potatoes and tomatoes, respectively, and those with higher incomes consumed 53.8 pounds of potatoes and 32.1 pounds of tomatoes per person. A bigger difference was observed in consumption of other vegetables (nonpotato and nontomato): 85.8 pounds per person for higher income individuals versus 69.8 pounds per person for lower income individuals. The more educated the adult, the more other vegetables (nonpotato and nontomato) eaten. In 2007-08, college-educated adults consumed 187.4 pounds of total vegetables per person per year, of which 100.7 pounds were other vegetables. Adults with only a high school education ate 181.9 pounds of total vegetables per person, of which 87.6 pounds were other vegetables. Adults who had less than a high school education consumed 158.2 pounds per person of all vegetables, of which 76.3 pounds were other vegetables. Total fruit consumption was lower in 2007-08 than in 1994-98 for all four age and gender groups. For example, girls’ consumption of fruit declined from 131.3 pounds per person per year in 1994-98 to 121.2 pounds in 2007-08. Some of the decline in total fruit consumption was due to less orange juice being drunk by all four groups. Orange juice is the largest fruit category in terms of consumption, and average U.S. consumption fell from the equivalent of 38.3 pounds of oranges per person per year in 1994-98 to 30.9 pounds in 2007-08. Falling orange juice consumption, however, was not the only driver of declining fruit consumption—declines were common for other fruits as well. Apple juice, berries, and grapes were the only fruits and fruit categories that had higher average U.S. consumption in 2007-08 than in 1994-98. Every demographic group examined displayed the same patterns for apple juice and orange juice consumption—larger quantities of apple juice and smaller quantities of orange juice were consumed in 2007-08 versus 1994-98. Trends in whole fruit consumption were not consistent across demographic groups. In this study, whole fruits comprised all categories of fruits consumed, minus orange juice and apple juice. Thus, whole fruit consumption includes a relatively small amount of juices from other fruits, such as pineapple juice and grape juice, in addition to whole fruits. Federal dietary guidance advises that at least half a person’s recommended daily intake of fruits be whole fruits. Whole fruit consumption declined for the age and gender groups between 1994-98 and 2007-08. For example, boys’ consumption of whole fruits fell from 71.9 pounds per person per year in 1994-98 to 65.4 pounds in 2007-08. For non-college-educated adults, consumption of whole fruits was relatively stable over the period, averaging around 65 pounds per person per year; for college-educated adults, it fell from 93.7 pounds in 1994-98 to 83.2 pounds in 2007-08. Higher income consumers’ consumption of whole fruit fell from 81.2 pounds per person per year in 1994-98 to 75.7 pounds in 2007-08, whereas lower income individuals consumed similar quantities in both periods. Non-Hispanic Whites and Hispanics’ consumption of whole fruits declined between 1994-98 and 2007-08, while non-Hispanic Blacks’ consumption in the two periods rose from 65.5 to 71.4 pounds per person per year. ERS’s food availability and loss-adjusted food availability data show that Americans are not increasing their intake of fruits and vegetables, despite the exhortations of health and nutrition experts. Federal food intake surveys also point out lower fruit and vegetable consumption. The big question for future research is why? In some cases, one or two particular fruits and vegetables make up much of the decrease. For vegetables, U.S. potato consumption has fallen from 61.3 to 52.0 pounds per person between 1994-98 and 2007-08, with bigger relative drops for boys and no change in potato consumption for non-Hispanic Blacks. Declining orange juice consumption among all demographic groups is the largest contributor to lower fruit consumption. Substitution among some products is also evident. Head lettuce is down, but leafy greens—such as spinach and kale—are up. Between 1994-98 and 2007-08, consumption of nonpotato and nontomato vegetables by women grew slightly from 85.5 to 87.7 pounds per person per year. For girls, boys, and men, small declines in consumption of nonpotato and nontomato vegetables occurred. Less bananas and citrus fruits are being consumed, but consumption of berries has risen over the decade. Increases in some whole fruits were not enough to offset declines in other fruits, and whole fruit consumption fell for all age and gender groups. Food choices are complex, and a multitude of factors affect what we buy and eat. Life style changes and time constraints can determine if we sit down with a glass of orange juice for breakfast, grab a banana on the way out, or forgo the meal altogether. Time for and interest in cooking play a role, too. More eating out could mean more fries on the side or consumption of vegetables not usually prepared at home. Dietary fads and widespread popularity of ethnic cuisines can cause shifts in food choices, including for fruits and vegetables. The price of products and the income available to buy them can also affect a person’s food choices. Smaller food budgets over time or higher prices due to supply constraints or other factors can induce one to switch to a lower priced alternative food item. Observing national trends and patterns for demographic groups is a first step in analyzing what is driving food choice and potential changes over time. Potatoes remain a staple in the American diet, whether fried or mashed. In fact, potatoes account for 15 percent of all consumed vegetables. Even though sweet potatoes are currently experiencing increased popularity, the potato remains king among Americans. Over 44 billion pounds of potatoes were harvested in 2015, compared with just a little under 3 billion pounds of sweet potatoes. One of the reasons potatoes continue to be such a dominant part of the American diet is inventing new ways to eat them. Starting in 1970, processed potato products surpassed raw potatoes in sales, and consumption of fresh potatoes fell from a high of 81 pounds per person in 1960 to an average of 42 pounds by the 2000s. But potato consumption has continued to increase as people find different ways to get their potato fix. On average, Americans now eat 55 pounds of frozen potatoes per year in addition to 17 pounds of potato chips. Potatoes’ distant vegetable relatives, squash and pumpkin (or eggplant, a type of squash), are not nearly as popular with Americans, but pumpkin production has steadily increased in recent years from a little less than 1 billion pounds in 2000 to a little more than 1.3 billion in 2014. Squash production, on the other hand, has slowly declined from almost 900 million pounds in 2000 to a little under 575 million in 2014. 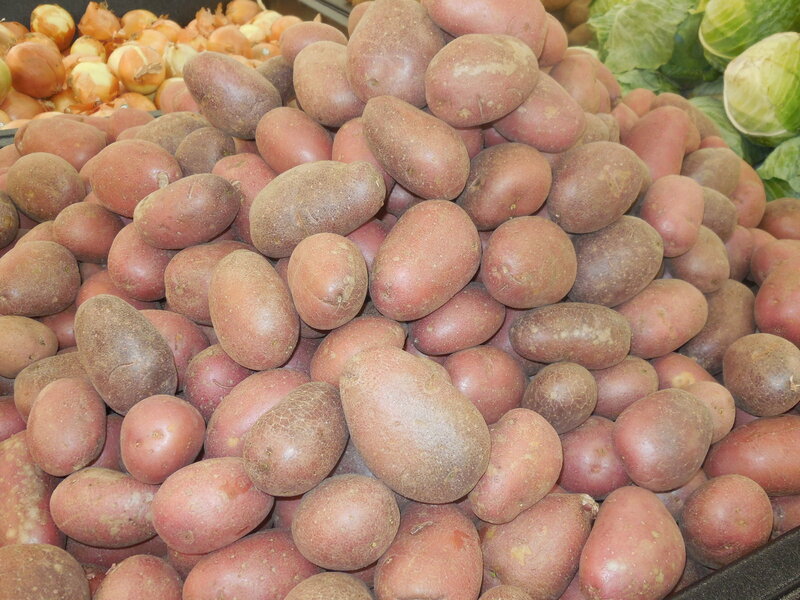 A new survey conducted by the Idaho Potato Commission revealed that 97 percent of Americans said they eat potatoes and more than 81 percent enjoy them as a side dish, snack or main course on average of three days per week. The survey also revealed that more men than women (84 percent vs. 78 percent) eat potatoes once a week, and that Midwesterners are more likely than those in other regions of the country to eat potatoes at least once a week (88 percent vs. 78 percent). Regarding how consumers eat their potatoes, the survey showed that baked (29 percent) led the way, followed by mashed (25 percent), French fries (17 percent), hash browns (9 percent) and potato chips (5 percent). Baked potatoes are favored more by those who are age 45 and up than by 18-44 year-olds (36 percent vs. 23 percent). More 18-44 year-olds than those who are 45 and older prefer French fries (21 percent vs. 12 percent). When survey participants were asked which vegetable they crave most, potatoes were the clear winner. Nearly one quarter (24 percent) of the Americans chose spuds, followed by leafy greens such as lettuce, kale or spinach (20 percent), broccoli (14 percent), tomatoes (13 percent) or corn (11 percent). Despite the growing “buy local” movement, 72 percent of Americans would eat Idaho potatoes over potatoes from other states, according to the survey. The Idaho Potato Commission survey was conducted by Kelton between Jan. 7 and Feb. 3 among 1,000 nationally representative Americans ages 18 and over using an email invitation and an online survey.